This is a quality Douglas Cuddle Toy with Hannah’s Special Heart Collar. 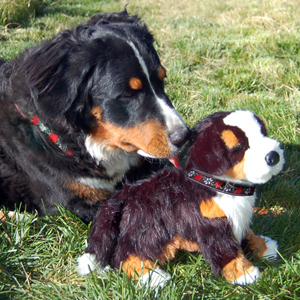 The Hannah toy is 16″ long and is the size of a real Bernese Mountain Dog puppy at 8 weeks of age. Hannah's books have won International Book Awards and a Literary Classics Award. Hannah is a woofer and a tweeter! You can follow Hannah's antics on Facebook, Instagram or Twitter. Or send her your best dog story and a photo for Facebook & Instagram. Hannah's books are distributed through Small Press United, 1-800-888-4741, and all major wholesalers such as Ingram and Baker & Taylor, or you can buy them online at our web store. 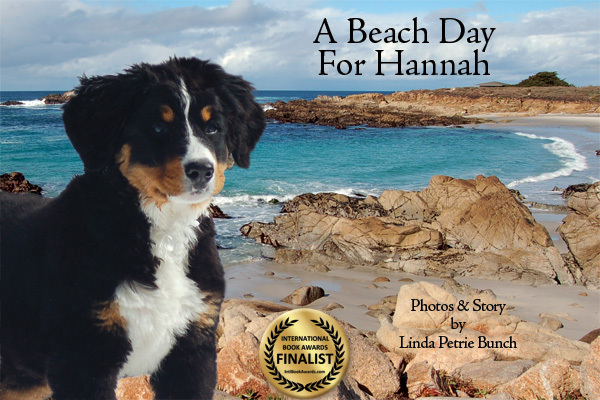 Hannah, the bouncy Bernese Mountain Dog, frolics on the California beaches of Carmel in her rhyming book, A BEACH DAY FOR HANNAH, a 2014 International Book Award Finalist for Children's Literature. Hannah's antics in the snow are transferred to the beach as she tests the ocean waters, crafts sand creations on the beach, and investigates her talents navigating the surf with board and sail. If you enjoyed "A SNOW DAY FOR HANNAH" you'll surely love the gorgeous photographs of our cute canine hero on one of the prettiest beaches in America. A BIRTH DAY FOR HANNAH, a 2018 Literary Classics Award Winner and a 2017 International Book Award Finalist for Children's Literature, is in bookstores and available online. 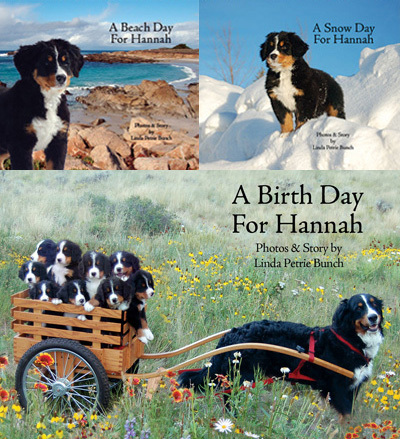 Hannah the Mountain Dog gives birth to 9 adorable Bernese puppies in this beautiful children's photo book with rhyming story. Follow the development and antics of the puppies from the week their eyes open to the week they are ready to celebrate their birthday, preparing to bounce out into the world on their own at eight weeks of age. 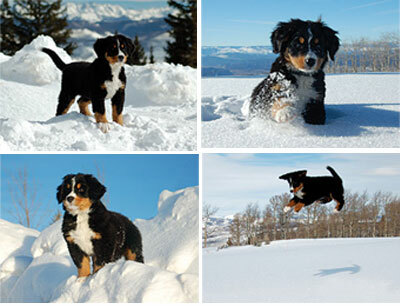 Hannah the Bernese Mountain Dog loves mountain climbing and the snow. When she sees a big snow storm brewing, she high-tails it home to wait out the weather. She can't wait until it's over because she will be able to bound outside and play in the fresh snow, building snowmen, snow angels and going sledding and hiking - just like every kid likes to do! 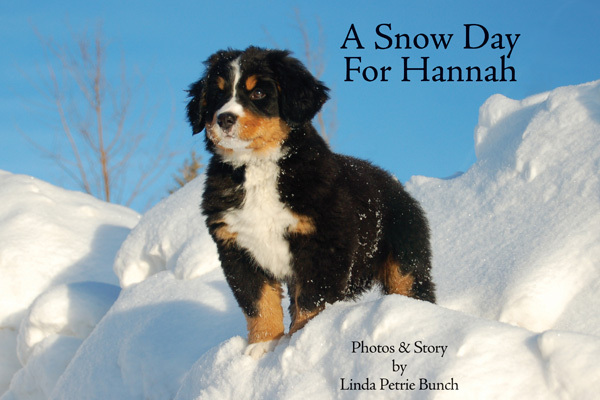 Follow Hannah's snow adventure in this adorable children's book. Filled with fabulous photographs of this cute little pup, enjoy the rhymes as you watch her climb up! Linda has loved - and been loved - by Bernese Mountain Dogs for more than twenty five years, as witnessed by her faithful Berner companions: Bela, Tam, Hannah, Lucy and Dot. Ms. Petrie Bunch has called Colorado home since she finished college at the University of Colorado, Boulder several dog years ago. She has taught classes at colleges and universities, and has a masters degree from the University of Denver. Since 1996, Linda has owned an Internet development and video business, Core Interactive Media, in Denver, Colorado. While that business tamped down, Linda ramped up again to purchase a television studio that provides live shots for network news stations in 2018. The company, MFG Studios, also provides interactive webcasting and video production. Always enjoying the world through a lens, Linda has created documentaries, directed political advertisements, and is an avid outdoor photographer and artist, painting in oils. Ms. Petrie Bunch enjoys hiking, skiing, and oil painting in the mountains of Eagle County, Colorado. She has been on the boards of non-profit organizations including Planned Parenthood and the Denver Film Society. Linda loves to play with her grandchildren and go on travel adventures with her husband, Jim Bunch, and their rambunctious Bernese Mountain Dogs, Hannah, Lucy, and Dot. 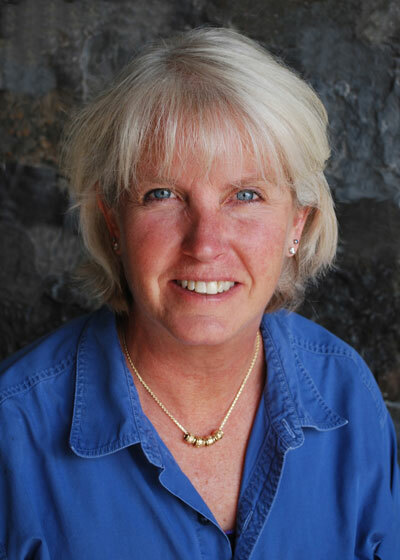 Petrie Bunch received an IPPY Award (Independent Book Publisher Award) in 2006 for a DVD that she created about author Pam Houston, along with reviews by Booklist and Video Librarian. She has created three children's books in the Mountain Dog Book Series: "A Beach Day for Hannah," photographed on the beautiful beaches of Carmel, CA - released in May 2012, "A Snow Day for Hannah," photographed near Vail, CO - released in October 2011, and “A Birth Day for Hannah,” photographed in Denver & Vail. "A Beach Day for Hannah" was a 2014 International Book Award Finalist, and “A Birth Day for Hannah” has received 2 distinguished literary awards. Linda and Hannah are available for bookstore, library, and elementary school book readings. "The stories and photos are just precious." 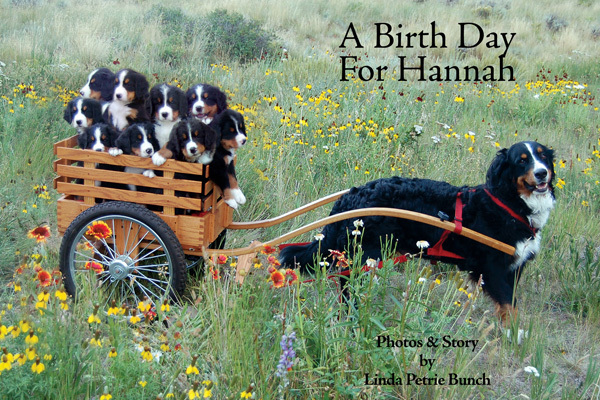 A BIRTH DAY FOR HANNAH is "another great book full of rambunctious puppies that leap and wiggle off the page, softly nudging the reader to buy another great Hannah story! I love it!"